Another in the Village Sign series . 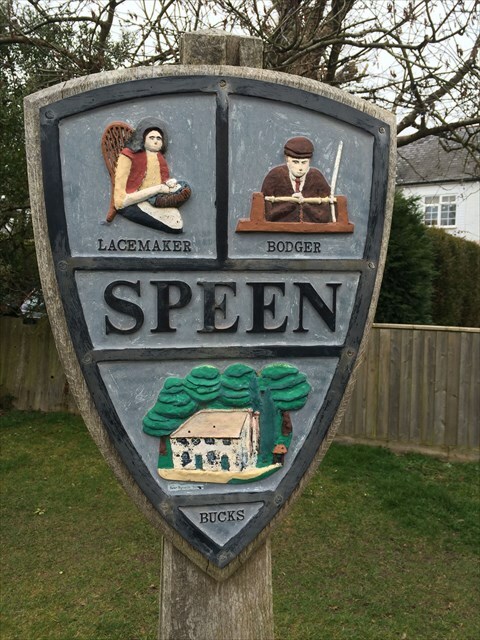 Please note that mobile/GPS/3G signal is very variable in Speen due to the topography. The Village Sign reflects two trades of the villagers in times past, bodging and lacemaking . The village name is Anglo Saxon in origin, and means "wood chips". This refers to the location of the hamlet in the Chiltern Forest where trees are likely to be felled fairly regularly. The village lies about two miles south-east of Lacey Green, forming part of Lacey Green Parish. The community has a long historySet upon a small plateau, it is embraced on three sides by the arms of the Iron Age earthwork, Grim's Ditch. This has given rise to the theory that the village might mark the site of an ancient settlement in the Chilterns. However, this theory is very difficult to prove and is a matter of conjecture. The origin of the name is somewhat obscure. Since the area was once surrounded by common woodland, the name may possibly derive from "Spene", "Spinis" or "Spinae", meaning "the hawthorn", or "Spon", meaning "wood shaving". Certainly an entry in the Black Prince's Register of 1351 refers to "... Spene in the Prince's Manor of Risborough"
A nineteenth century Methodist Cleric records conducting an open air service in "Spien" on the eighth of August 1836. An estimated congregation of four hundred persons listened attentively to his sermon. The reason for his visit was two men in the village had been fighting, one killing the other, while engaging in organised bare fist fighting. Over a period of six months no less than three people within five miles radius had been killed due to fighting. The brother of the man killed at Speen had killed another and was in prison. It was thought a visit to the village at such a time would do good. The Horse Trust, based at Speen, provides a home of rest for horses, and is the place where some horses in royal or military service are retired to when they get too old or become injured. Many of the horses that were injured when the IRA bombed the Royal Horse Guards in the early 1980s were brought here (Sefton being the most famous), and the stables have become a popular tourist attraction for animal lovers. Brick and flint cottages, some reputedly dating back over four centuries, are now intermingled with those of modern construction.Today the village contains no less than fourteen listed buildings, dating from the fifteenth to the nineteenth century. Approaching Speen from the south east one of these is Speen Baptist Church in Chapel Hill. In 1928 the artist Eric Gill moved to Pigotts at Speen, where he set up a printing press, and lettering workshop and alternative community.He designed several well known typefaces including Gill sans which was an immediate success being used by the national railways and Penguin books amongst others. The posted coordinates are for the Village Sign. The cache is a short walk away , please do not drive up to it as there are no opportunities to turn around .